180 gram LP. Recorded at Greenwich Villages Caf Bohemia on December 23, 1955, this brilliant live performance is an example of Mingus' well-known Jazz Workshop period, an oft-cited early precursor to free jazz. 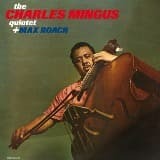 At this time, Mingus was the worlds finest living bass player and one of the few true geniuses of the instrument. The outstanding rhythm section on this album is made up of Mingus on bass, Max Roach on drums and Mal Waldron on piano, while George Barrow and Eddie Bert play tenor sax and trombone, respectively. The quintet tackles standards like Gershwins "A Foggy Day" and "Ill Remember April", along with three Mingus originals, including the first ever recording of his classic composition, "Haitian Fight Song".